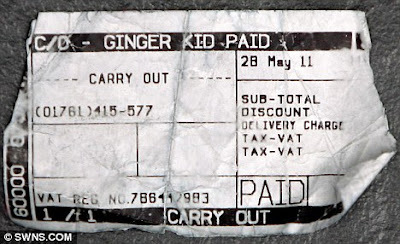 A young boy was left shocked and upset after a Domino's Pizza employee labelled his order as 'Ginger Kid'. 11 year old Ross Wajgtknecht had given his full name when ordering the takeaway pizza yet the employee had decided to refer to him by his hair colour instead. Ross's father thinks the labelling of his son as 'Ginger Kid' was malicious. 'It is totally disgusting. You would not describe someone by the colour of their skin or by calling them fat so why is it okay to call Ross ginger? 'Surely if they were writing his name on the receipt it would have been easier to write Ross. That only has four letters. Why write Ginger Kid instead? 'I think they picked on him because he is just a lad and they knew he wouldn't defend himself. 'It is prejudice. There is no way this should happen from adults in a workplace. Domino's has apologised for causing upset but does not accept that the labelling was malicious. "Wajgtknecht" - I wonder if it was Smith it would have printed.